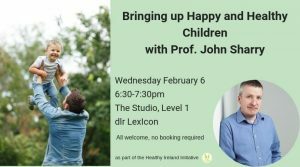 Drawing on the Parents Plus Healthy Families Programme, John will outline the key family habits that lead to happy and healthy children. The talk will cover the importance of establishing routines around healthy eating, physical activity, screentime and sleep, as well as how to promote positive mental health and self-esteem in your children. John is a social worker, child and family psychotherapist with over 25 years’ experience and a weekly columnist with The Irish Times. All welcome, no booking necessary.